DK15-02 Brown is an epoxy-based coating powder developed as an epoxy resin binder when making powdered iron core or pot-core type reactors or induction devices. A powdered iron core is a magnetic material that has an inherently distributed air gap. Though it is made almost entirely of iron, it is mixed with an epoxy binder (such as the DK15-02 Brown) and pressed with a very large pressure into the final core shape. The distributed air gap allows the core to store higher levels of magnetic flux when compared to other magnetic materials such as ferrites. This characteristic allows a higher DC current level to flow through the inductor before the inductor saturates. 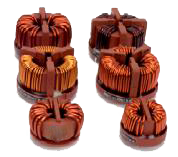 A pot core is usually made of ferrite or similar magnetic material and is used for inductors and transformers. The shape of a pot core is round with an internal hollow that almost completely encloses the coil. Usually, a pot core is made in two halves which fit together around a coil former (bobbin). This design of core has a shielding effect, preventing radiation and reducing electromagnetic interference. 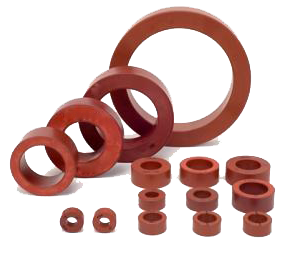 Once the iron, ferrite or other magnetic metal cores are pressed into the desired shape, using the DK15-02 Brown Epoxy Binder Resin, the whole part is cured via a baking process. DK15-02 Brown is also used for electrical insulation of toroids, current transformers, magnetic and powder cores. The advantage of DK15-02 Brown in these cases is that it can be blow-coated. 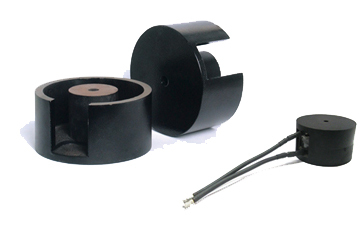 As a toroid or current transformer coating, it offers cut-through temperature resistance with good edge coverage and is UL recognized for 130ºC operating temperature. Though DK15-02 Brown was designed to be applied via a blow coating process and can be also be applied via a standard fluid bed process in most applications.